While Tanzania’s gold production increased by more than 700% over the past 25 years, from 5 to 40–50t per year, South Africa’s production of gold decreased from over 500t in 1990 to 140t in 2015. Gold export accounted for USD1.3b of the total value of Tanzania’s export in 2015 (i.e. 22%), representing more than 90% of the country’s minerals export. Tanzania’s gold export remained steady over the past 5 years with USD1.3b in 2010. 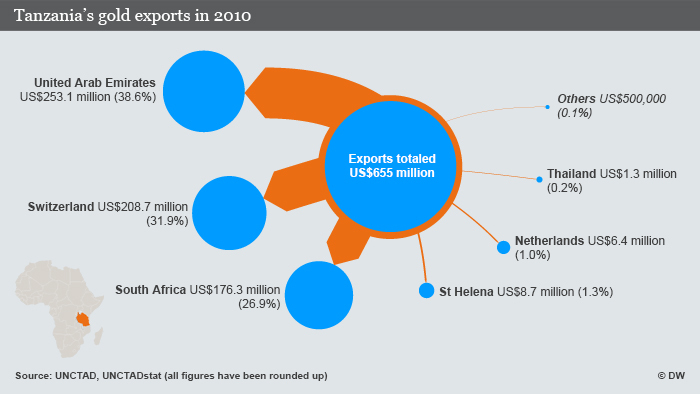 Tanzania exports gold mainly to South Africa, India and Switzerland. Bulyanhulu is an underground gold mine in the Shinyanga region of Northwestern Tanzania, located 55km south of Lake Victoria and operated by Acacia Mining (LON: ACA). Bulyanhulu commenced commercial production in 2001 and has produced over 3m oz of gold to date. The current life of the mine is estimated to be more than 20 years, based on its proven and probable gold reserves of 6.1m oz. Total reserves and resources at Bulyanhulu are estimated to be 17.1m oz. In 2015, Acacia pulled out 273,552 oz of gold and aims at reaching 350,000 per year over the medium term. Buzwagi is an open pit gold mine in the Shinyanga region of Northwestern Tanzania, located 6km southeast from the town of Kahama in Tanzania. It is also operated by Acacia Mining. Buzwagi commenced commercial production in 2009 and has produced over 1m oz of gold to date. The current life of the mine is estimated to be 4 years based on its proven and probable gold reserves of 0.6m oz. Total reserves and resources at Buzwagi are estimated to be 2.7m oz. In 2015, Acacia pulled out 171,172 oz of gold. North Mara is a combined open pit and underground gold mine in the Mara Region of Tanzania and also operated by Acacia Mining. North Mara commenced commercial production in 2002 and has produced over 2m oz of gold to date. The current life of the mine is estimated to be 9 years based on proven and probable gold reserves of 2m oz. Total reserves and resources at North Mara are estimated to be 3.8m oz. In 2015, Acacia pulled out 287,178 oz of gold. Geita is an open pit gold mine located in the Geita region of Northwestern Tanzania. Geita started operations in 2000, initially as a joint venture of AngloGold and Ashanti. With the merger of the two companies in 2004, the mine became fully owned by AngloGold Ashanti (JSE:ANG, NYSE:AU, ASX:AGG). Since 2000, the Geita gold mine has produced more than 3m oz of gold. In 2010, the life of the mine was estimated to be more than 10 years. In 2015, AngloGold Ashanti’s gold production out of Geita stood at 527,000 oz. New Luika is an active gold mine in the Mbeya region of Tanzania. It is fully owned by Shanta Gold (AIM: SHG), which started gold extraction in 2012. The current life of the mine is estimated to be 6 years. New Luika’s total gold resource is estimated at 2.9m oz. In 2015, Shanta Gold produced 81,873 oz of gold out of New Luika. Golden Pride was an open pit gold mine located in the Tabora Region of Tanzania. Resolute, an Australian mining company, began construction of the Golden Pride mine in 1997 and operated the mine for 15 years producing more than 2.2m oz of gold. Other closed gold mines in Tanzania include Kirondatal, Sekenke and Tulawaka.